Awesome, FREE expansion of the forest maze! So, at some point, the PCs will probably stumble over (or seek out) the massive forest maze within the haunted forest, as it holds a rather crucial component for many of the resolution-paths of the main module. The entrance to said maze is expanded in this pdf, in the guise of brownies testing the PCs (and introducing them to the delightful concept of minitaurs!). 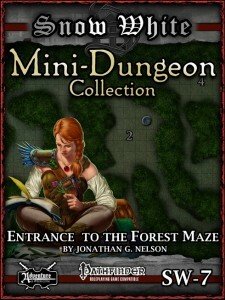 Beyond these, the pdf sports a cool “move matches”-style puzzle with sticks and a well-crafted riddle…oh, and the pdf makes ample use of the absolutely awesome flora and fauna introduced in Snow-White, so yeah – an all around awesome mini-dungeon! Jonathan G. Nelson’s “Entrance to the Forest Maze” may well be the best of the whole series – and when Stephen Yeardley is the guy your material has to compete with, that means something. If you’re using Snow-White, this is absolutely brilliant – the use of the unique flora and fauna of the haunted forest makes this mini-dungeon feel unique and alive and seeing a well-crafted puzzle and a good riddle as well offers something for players to do beyond killing everything. Now there is one catch – you practically need Snow-White to get something out of this – but even if you don’t you can still scavenge puzzle and riddle…and it should be emphasized: This is FREE and costs literally nothing…so go ahead and get this cool, fun mini-dungeon. This would be 5 stars +seal of approval even if it weren’t free. You can get this awesome expansion/mini-module for FREE here on OBS!